We're still relatively early in the season and nothing profoundly weird has happened yet. As such, I'm not really sure what to say here to introduce this fixture. Stoke has not been a happy hunting ground for Arsenal in the past, but a 4-1 win there just three months ago should give the Gunners some confidence headed into this one. Picking up another win while Laurent Koscielny is still suspended would be quite nice as well. Making it six points from two games would be even better, especially with a trip to Anfield on the horizon. So, uh, yeah, let's win. Per Mertesacker, who received that nasty gash from Gary Cahill in the Community Shield, is expected to be available again for this match. Shkodran Mustafi (match fitness) and Francis Coquelin (ankle) are likely to be available as well. However, there do not appear to be returns on the cards for any of the players who were listed as "out" last week, including Alexis Sánchez's abdominal problem, Gabriel's knee injury, and the long-term injuries to Jack Wilshere and Santi Cazorla. Additionally, Gabriel might play for Valencia by the time you read this. Laurent Koscielny will serve the final match of his three-match ban stemming from his red card on the final day of the league season last year; he'll be available again for the trip to Liverpool next weekend. Without a return for Alexis, I would imagine the forward trio will start the same as it was against Leicester. Aaron Ramsey may come in for Mohamed Elneny, while the returning center backs could earn a rest for Rob Holding, who has been a little shaky thus far, pushing Sead Kolašinac to his more natural left wingback position. Predicted XI: Čech, Mustafi, Mertesacker, Monreal, Bellerín, Kolašinac, Xhaka, Ramsey, Özil, Welbeck, Lacazette. Arsenal last visited Stoke three months ago, so the Potters' long-term absentee list is exactly the same now as it was back then. Stephen Ireland has been out for 16 months now after a double leg break. He's back in training now, so his return is now a matter of weeks and not months. Prior to that match in May, Ibrahim Afellay had recently undergone knee surgery, so he remains out as well. Three at the back is en vogue in Stoke, too; Mark Hughes brought in Kurt Zouma on loan from Chelsea to that end and he'll likely start alongside Ryan Shawcross and Geoff Cameron. Hughes has also brought in Jesé on loan from Paris Saint-Germain to start up top along with new signing Eric Maxim Choupo-Moting from Schalke. Predicted XI: Butland, Zouma, Shawcross, Cameron, Johnson, Pieters, Allen, Fletcher, Shaqiri, Choupo-Moting, Jesé. Arsenal opened their 2017/18 campaign with a bonkers 4-3 win over Leicester City, while Stoke opened their campaign with a significantly less bonkers 1-0 loss to Everton. If you somehow don't know what happened last week, here's a recap: Alexandre Lacazette opened his Arsenal account on two minutes (which was half the time it took for Samir Nasri back in 2009, so that's nice.) Leicester were level two minutes later and led through Jamie Vardy before Danny Welbeck pulled Arsenal level just before halftime. Jamie Vardy put Leicester ahead again, but Aaron Ramsey and Olivier Giroud struck two minutes apart to seal a 4-3 win. Each of Arsenal's last three home wins against Leicester City have come by a goal in the dying minutes; Giroud's 85th minute winner was the earliest of the three. Stoke, on the other hand, managed only one shot on target in their opening day trip to Goodison Park and it was Wayne Rooney, on his homecoming, who provided the difference with a header in first half injury time. I've told the story of Arsenal's struggles at Stoke many times before, so here's the condensed version I told in May: In November of 2008, Robin van Persie was goaded into a red card, as Stoke won 2-1 (Gaël Clichy added a meaningless goal at the death.) In January of 2010, in the FA Cup, Arsène Wenger started a heavily rotated side, but brought in his super subs at 1-1 in the 67th minute, then lost 3-1 anyway. In February of 2010, Aaron Ramsey broke his leg and Arsenal scored twice in injury time against Stoke's ten men to win 3-1; until May, it was their only win at Stoke. In May of 2011, Arsenal lost 3-1 there again. 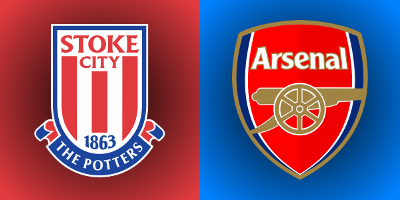 In April of 2012, then in August of 2012, Arsenal came out of Stoke with a single point on each occasion, drawing 0-0 and 1-1, respectively. But in May, Arsenal finally got a big win under their belt at the Potteries, even if Peter Crouch was allowed to score with his hands. Olivier Giroud scored twice while Mesut Özil and Alexis Sánchez added the others to give the Gunners their most comprehensive win ever at the Britannia/Bet365 Stadium, 4-1. At the Emirates in December of last year, Arsenal came from 1-0 down after Stoke took the lead from a penalty conceded by Granit Xhaka, to win 3-1, with goals from Theo Walcott, Özil, and Alex Iwobi. The referee is West Midlands-based Andre Marriner. You will, of course, remember Marriner from what I now only refer to as "that thing that time." Arsenal have only lost twice with Marriner since that thing that time over 11 matches; oddly enough, both have been home games against Watford, including last year's 2-1 defeat on January 31. Since then, Marriner was in the middle for Arsenal's 2-2 home draw against Manchester City and their 2-0 home win against Manchester United. Earlier in the year, he had worked Arsenal's come from behind 1-1 draw at Old Trafford and a 2-0 win on New Year's Day against Crystal Palace, complete with an Olivier Giroud scorpion kick. Last year, Stoke City only saw Marriner once, for a 1-1 draw at West Ham on November 5. Back in 2014, before that thing that time, Stoke City made an official complaint about Marriner's officiating (it was their third official complaint of the year!) Ryan Shawcross was sent off, while Emmanuel Adebayor escaped sanction for elbowing Shawcross earlier. Wow, a whole bunch of people who have a history with Arsenal in that sentence, eh? John Painting is a contributing writer to the Modern Gooner and a hydraulic engine. You can follow him on Twitter @zorrocat for vroom vroom vroom vroom.